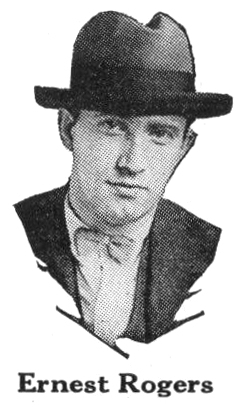 Ernest Rogers, as pictured in a 1930 Victor catalog. William Ernest Rogers was born on October 27, 1897 in Atlanta, Georgia. He was crippled by infantile paralysis at the age of two, but that evidently didn’t slow him down. He attended Emory University—where he was the champion debater, a member of the glee club, mandolin club, and literary society, and founder of the campus newspaper, the Emory Wheel—and graduated with a Bachelor of Science in 1920. After college, Rogers found work as an editor, reporter, arts critic, and features writer for the Atlanta Journal, with whom he remained until 1962. He married Bertha Turnipseed and they had one child, Wallace. On the side, Ernest sang and played the guitar, and reportedly served as a performer and announcer on the Atlanta radio station WSB. His repertoire consisted primarily of vaudevillian material, including such songs as “Steamboat Bill”, “Waitin’ for the ‘Robert E. Lee'”, and “Willie the Weeper”, as well as a few compositions of his own, like “My Red-Haired Lady” and “Let Me Be Your Man in the Moon”. He made his first record for the Columbia Phonograph Company in January of 1925, during their second field trip to Atlanta, cutting two sides, which were issued. Two years later, the Victor Talking Machine company brought their recording equipment to Atlanta, and Rogers cut another two sides. Victor must’ve liked him, because he had two more sessions with them in May of ’27 and February of ’28, producing a further eight sides. Of the twelve sides he recorded, all but two were released. Following the culmination of his recording career, Ernest Rogers continued to have success in the literary world, publishing relatively successful books: The Old Hokum Bucket in 1949, and Peachtree Parade in 1956, both compilations of his newspaper columns. Ernest Rogers died on October 9, 1967 in Atlanta. An entirely different and unrelated Ernest Rogers recorded “Baby, Low Down, Oh, Low Down Dirty Dog” for John A. Lomax in Angola Prison Farm in July of 1934. Victor 20502 was recorded in two quite separate sessions: the first side was at the Elyea Talking Machine Co. in Atlanta, Georgia on February 17, 1927, while the second was recorded almost two years earlier in New York City on June 25, 1925. It was released in May of 1927, and remained Victor’s catalog all the way into 1944. First, Ernest Rogers sings a classic vaudeville song by the name of “Willie the Weeper”, or in this case “Willie the Chimney Sweeper”. You may notice more than a passing similarity to Cab Calloway’s famous “Minnie the Moocher”, which drew heavily on the song. Rogers recorded “Willie the Weeper” at his first session for Columbia, as well—I’ve never heard that version, but I’d assume it’s much the same as this one. 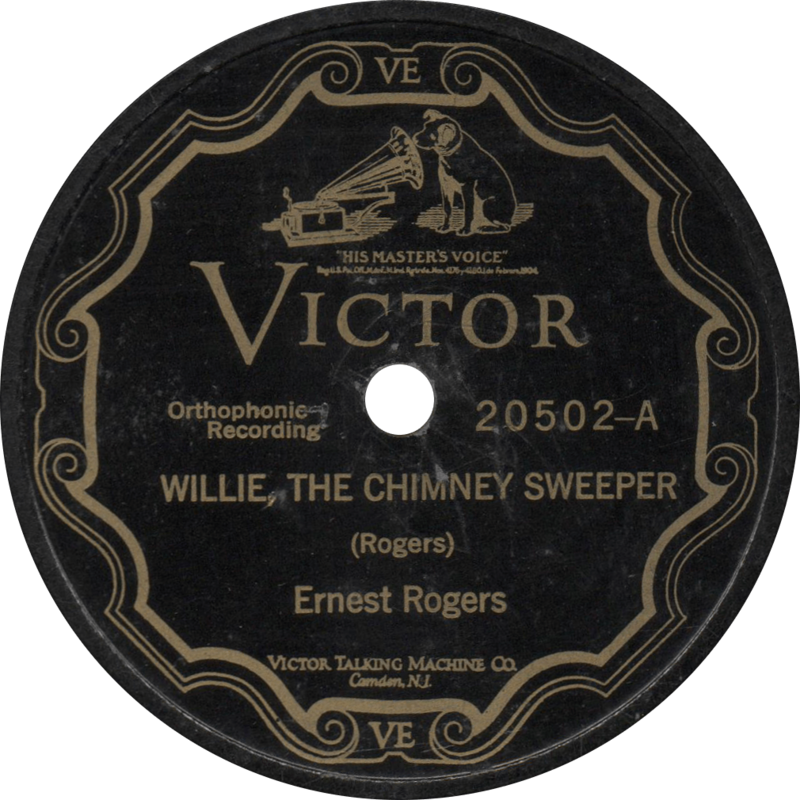 Willie, the Chimney Sweeper, recorded February 17, 1927 by Ernest Rogers. On the reverse, our ol’ pal Vernon Dalhart sings a perfectly solid rendition of another old vaudeville standby, “Casey Jones”, with Carson Robison on guitar, and harmonica and Jew’s harp played by Dalhart himself. Say what you will about Dalhart, but this record—both sides—truly is a great piece of Americana. 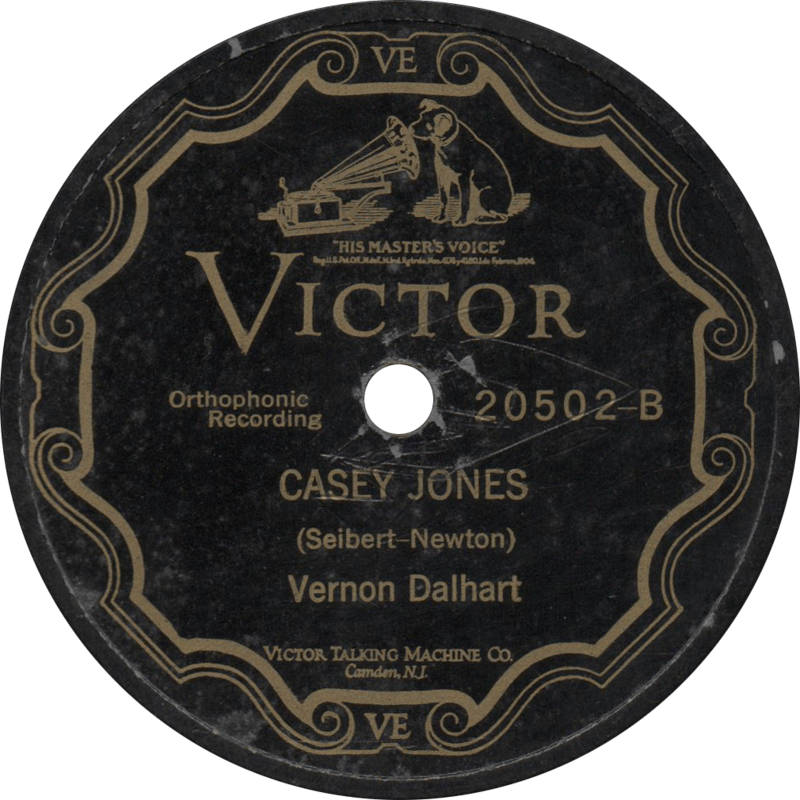 Casey Jones, recorded June 25, 1925 by Vernon Dalhart. This entry was posted in Records and tagged 1920s, 1925, 1927, Carson Robison, Citybilly, Ernest Rogers, Folk, Hillbilly, Singing with Guitar, Vernon Dalhart, Victor by R. Connor Montgomery. Bookmark the permalink.